Tesco is to launch a new "farm and factory" website as part of plans to open up its food supply chain to consumers, in the wake of the ongoing horsemeat scandal. Chief executive Philip Clarke appeared in a video blog on Tesco's website, in which he said: "Nothing is more important to Tesco than the trust our customers place in us. And that trust depends on the quality of the products we sell." He described a number of measures that the supermarket was taking in response to horse being found in some of its own-brand meat products. He said: "We're going to have a new digital website which will allow you to see exactly how we're getting on with ensuring that the supply chain is the best in the world. "Eventually, we will take you right the way into the farms and the factories. We'll allow you to see who the farmers are, how they produce for us, the care and attention that I know that they make." "And then into the factories, so you can see the people on the lines putting together the ready meals that are going to end up on your plate." Clarke attempted to reassure consumers over the horsemeat found in its burgers, saying the supermarket would "set a new benchmark" to ensure, "if it isn't on the label, it isn't in the product". Meanwhile, government ministers are struggling to reassure consumers after tests revealed that traces of potentially dangerous veterinary drugs have been found in meat. Clarke said that Tesco had been working "flat out to get to the bottom of the issue". He added: "Here’s my promise: we will set a new benchmark for the testing of products, to give you confidence that if it isn’t on the label, it isn’t in the product. And that will be backed up by an industry leading commitment to enable you to find out much more about what's in the food we sell and how it’s produced." 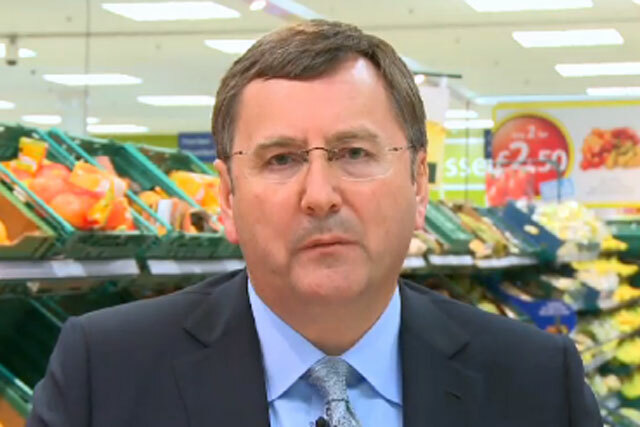 Clarke's comments come a day after Tesco chief marketing officer Matt Atkinson appeared on the video channel talking about Tesco's forthcoming advertising campaign, which he promised would re-engage customers in a "new conversation". Meanwhile, 11 of UK's largest food suppliers, including Tesco, Compass Group, Asda and Sainsbury's have today issued a public letter saying they shared the public's "anger and outrage" over the revelations.